Sean Howe just found that the University of Wisconsin-Madison has in its library a 300-page thesis called: "An approach to the profession of the comic strip cartooning based upon an analytical survey of current trends and personal experiences" dating from 1942. It's one of the earliest, if not the earliest, example I have heard of where comics were openly discussed in an academic manner. So I wondered, who would be writing such an extended academic study of comics back in '42? Well, the author of the work is one Paul Henry Cassidy. The name probably isn't familiar to a lot of you, but he is actually a name worth knowing. After all, he was an artist on the earliest (single digit) issues of Superman! Cassidy was born in 1910 and grew up in Illinois. He attended the University of Wisconsin-Madison from 1928-1934, getting a bachelor's in applied arts and a master's in art education. He became the graphic arts teacher at the Milwaukee Vocational School. Superman, as you probably know, was an immediate success, and artist Joe Shuster soon found he had more work than he could handle. (Two monthly comics and a daily newspaper strip!) So he started bringing in other artists to ghost his own work, with Cassidy allegedly being the first in 1938. Cassidy and his wife moved to Cleveland where he worked with Shuster on any number of Superman stories, ostensibly a little shy of 9,000 individual panels between the strips and books. He worked as an artist for World Book Encyclopedia and as the art director for ChildCraft books (both companies of Field Enterprise). Still interested in comics, he tried his hand at his own strip called Fantasy, the Moon Boy although it proved unsuccessful. He eventually returned to Milwaukee in 1964, where headed up the graphic arts department at what is now known as Milwaukee Area Technical College. Cassidy is notable for adding many now iconic elements to Superman's visual. 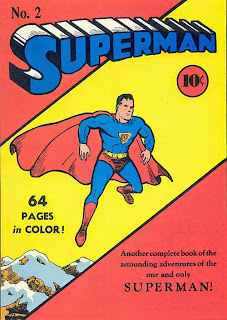 He was the one who consistently drew the five-corner shield symbol, and added the all-yellow version to Superman's cape. Cassidy also use the cape in a more naturalistic way, having it wave all over the place and having it bunching up at the shoulders. The 1942 date on that thesis is a little confusing, since Cassidy was no longer a student then, as far as I can tell; however since it does expressly note that it includes his "personal experiences" it might be a situation where he had done all his graduate work except his thesis, only finishing that up years after he left the school. If so, the 1942 date makes this very exciting because that it would mean it is a first-hand contemporaneous account of the earliest days of the comic book industry. On Strips: Is It Really a Format Issue? On -isms: Better or Worse? On Strips: Brumsic Brandon Jr.
On Fandom: What's in a Collection? On -isms: Same As It Ever Was? On Webcomics: Why So Few Encores? On Fandom: Organization? In My Collection?